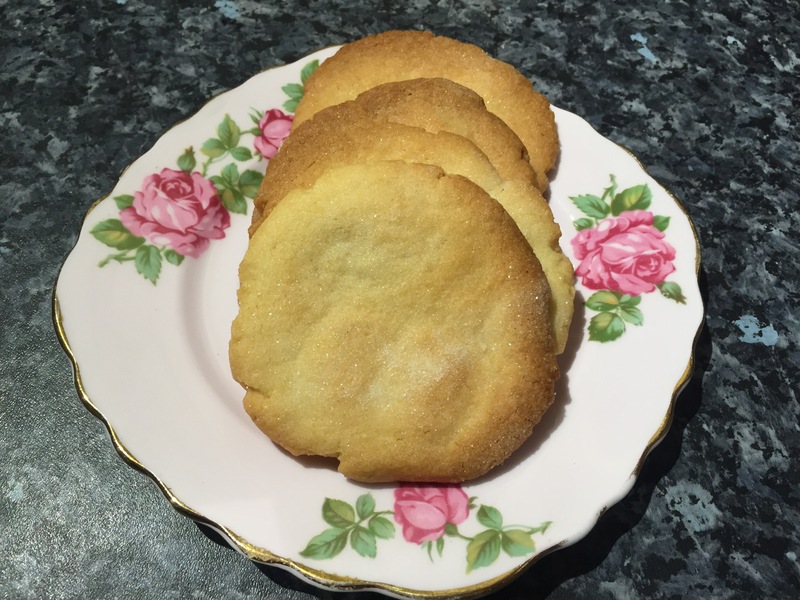 A lovely simple biscuit, quick and easy to work with and it gives a delightfully crisp buttery biscuit. Nothing fancy at all, as simple and wholesome as a biscuit can get! These biscuits remind me of some I had as a child at a farmhouse on the way to the lake district. There were no such things as hygiene certificates then, this was literally the farmer’s wife selling tea and biscuits in her kitchen and they were some of the best I’ve ever had! Heat the oven to gas mark 5 and prepare two baking trays with baking paper. Cream together the butter and the sugar in a small mixing bowl. Add the egg yolk and beat well to combine. Add the flour and the salt (if your flour is at all lumpy do sift it in as it will mix easier). Bring all the ingredients together into a soft dough. It can help to use your hand to get it all together in the last bit. Pinch off small walnut sized balls of dough and roll them in your palms to shape into rounds. Place on the baking tray and use the heel of your palm to squish them flat. Sprinkle the tops with the extra sugar. Bake for 10 minutes until the edges are just starting to colour. Remove from the oven and allow to sit on the tray for 5 minutes before trying to move them as they will break otherwise. Allow to cook on a wire rack. Put on a pot of tea and enjoy!